Joe Dryer hit a hat-trick as Shoreham Football Club returned to action with victory at Peacehaven & Telscombe on Saturday. Southern Combination League leaders Mussels began the year with back-to-back defeats – to Littlehampton in the league and Bognor in the Sussex Senior Cup – and then had two matches postponed. Haywards Heath closed the gap on Mussels to a point with a 2-0 win at Lancing last week. The top two both won again on Saturday, Haywards Heath 1-0 at Worthing United, but Shoreham have two games in hand. Shoreham boss Bryan O’Toole was delighted with his side’s performance against the Magpies and said: “I thought we could be a little rusty as we hadn’t played for 18 days but we were brilliant. “I asked the boys to start with a quick tempo, which they did and we could have been eight or nine up in the first half. Rob O’Toole had two shots cleared off the line and Richard Greenfield headed over, before Mussels went ahead on 30 minutes. Dryer drove forward and then rifled a low left-footed drive into the far corner. Rob O’Toole then crashed a penalty against the bar, while Shoreham had another spot-kick appeal waved away in the first half. Mussels doubled their lead just before the hour when Rob O’Toole crossed for Dryer to tap home from close range. Peacehaven pulled a goal back through Marcus Allen on 71 minutes but Shoreham moved 3-1 ahead on 79 minutes. Kevin Keehan was brought down in the penalty area and Dryer stepped up to fire home the spot-kick and complete his hat-trick. Dryer then had a header superbly saved as Shoreham returned to action with all three points. 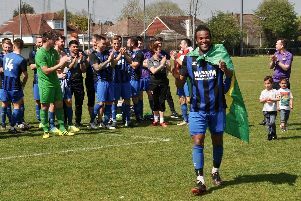 Shoreham now have three successive home games, beginning with Broadbridge Heath on Saturday, before Eastbourne Town and Worthing United visit Middle Road. Bryan O’Toole said: “They will all be tough but they’re winnable games if we are on it like we were on Saturday. However, with the gap at the top just a point now they’re all becoming pressure games that we have to win. “Teams also raise their games when they play us as we’ve found out a few times this season. We’ve just got to look to make fast starts to every game and get an early goal or two if we can to open games up. Midfielder Joe Keehan is back available for Broadbridge Heath’s visit on Saturday. SHOREHAM: Heyburn; Packer, Denyer, O’Hagan, Hartley; Greenfield, K.Keehan, Burton, Dryer; R.O’Toole, Deen. Subs: Storrie (Burton 60), Pearson (Denyer 75), Cradock (Greenfield 85), Martin, Garrod.